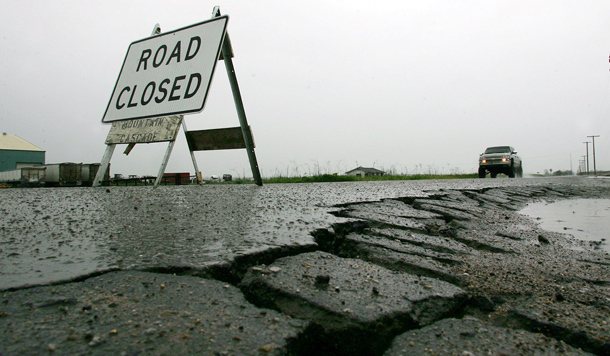 The dire state of America’s infrastructure is an all-too-familiar story. From dramatic cases of bridges collapsing and levees breaking to the more mundane but still very important problems of commutes lengthening, energy grids deteriorating, and transit becoming less reliable, we have not been making adequate investments in our nation’s infrastructure. This is the case despite abundant evidence of the needs and the benefits: Infrastructure investments boost productivity and spur economic growth, which is ever more important as other countries are making investments to pass us by. So why has the United States neglected infrastructure investment? There are certainly many causes, but one factor that has not received adequate attention is the decline of our middle class. When the middle class is strong, their interests—such as for greater investments in infrastructure—are more likely to be translated into political action. But when society is very unequal, the priorities of the rich tend to dominate. Indeed, over the past several decades, America has become less of a middle-class society, with the share of income going to the middle class—defined as the middle 60 percent of the population—falling to just 46.5 percent in 2010 from 52.3 percent in 1967 as the wealthy have captured most of the economy’s gains. The top 1 percent has seen their share of income increase to 19.8 percent from 11.2 percent over the same time period. Over the same period, as can be seen in Figure 1, federal investments in infrastructure declined as a percentage of the economy, falling by more than half as a share of gross domestic product—the broadest measure of economic activity—even after accounting for the uptick in infrastructure spending sparked by the American Recovery and Reinvestment Act of 2009. In 2011 federal infrastructure spending was 1.3 percent of GDP—a severe decline from 3.3 percent in 1968. To be sure, this simple correlation between growing income inequality and declining public investments in infrastructure ignores a host of other factors that could be driving this relationship, among them which party controls government and the changing nature of the economy. But there is ample evidence that one of the reasons we aren’t making adequate investments in infrastructure is because high levels of economic inequality have distorted our democratic process. Academic studies examined in this issue brief alongside our own analysis indicate that the same relationship between a growing middle class and rising infrastructure investments occurs in other countries as well as here at home in our 50 states. Indeed, the current debate in Congress over transportation funding illustrates some of the failings of our democracy that are fueled by the decline of the middle class. The gridlock that has produced a number of “temporary” extensions of the transportation funding bill, rather than a long-term bill to provide stable and adequate funding, is a hallmark of economic inequality. According to political scientists Nolan McCarthy, Howard Rosenthal, and Keith T. Poole, who have studied congressional voting patterns from 1879 to the present, income inequality leads to a widening divide between the political parties creating gridlock. And make no mistake, the broader American public supports increased investments in infrastructure. Ninety-three percent feel making improvements to infrastructure is important; 72 percent support “increasing federal spending to build and repair roads, bridges, and schools”; and 81 percent are prepared to pay more in taxes to do so. Yet infrastructure spending is unlikely to increase. The current Congress is poised to either keep spending at current insufficient levels or make cuts. The Senate majority recently passed a short, two-year extension of the transportation funding bill that continues spending at current levels. Reports on the draft-stage House majority transportation bill indicate that it will significantly reduce transportation funding, particularly for transit. Similarly, the forthcoming budget plan for fiscal year 2013 from the House majority cuts tens of billions of dollars in discretionary spending, which includes infrastructure spending, every year compared to the president’s budget while cutting taxes for the wealthy. The plan would reduce transportation infrastructure investment per capita by 28 percent from 2010 levels. Significant increases are not on the table in large part because of strong opposition to raising taxes to pay for the spending. The wealthy place a much higher priority on keeping taxes low than does the middle class, according to a number of academic studies. 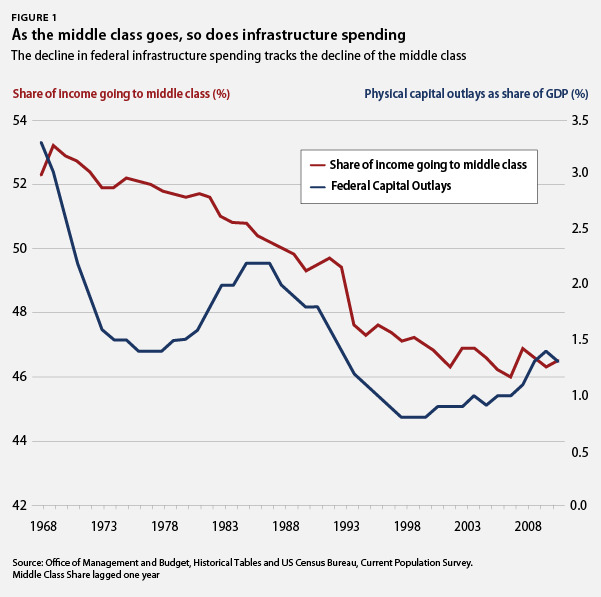 In short, there are good reasons to think that the decline of the middle class may at least be partly responsible for our underinvestment in infrastructure. We detail those links in this issue brief. Numerous organizations and studies point out the need for increased public investment in infrastructure. The American Society of Civil Engineers gave the American infrastructure system an overall grade of D in 2009, reflecting poor grades for roads, dams, drinking water, and schools. Our colleague Donna Cooper calculated that the federal government needs to boost infrastructure spending by $48 billion a year, which would induce $11 billion in state and local spending. Another study by the Political Economy Research Institute at the University of Massachusetts, Amherst, and the Alliance for American Manufacturing came to a similar conclusion, calculating that the entire public sector would need to contribute $54 billion per year to meet the long-term need for infrastructure. Adequate investments in infrastructure are essential for the long-term economic health of our country. Economists have long recognized the importance of investment to economic growth. Infrastructure investments in our interstate highway system or our railroads reduce transactions costs in the economy. Government investments in research and development create technologies, such as the Internet, which also boost growth. And public investments in education help create productive workers. Research by economists David Aschauer and Alicia Munnell find that public investments serve as a complement to private investments and help boost economic growth. 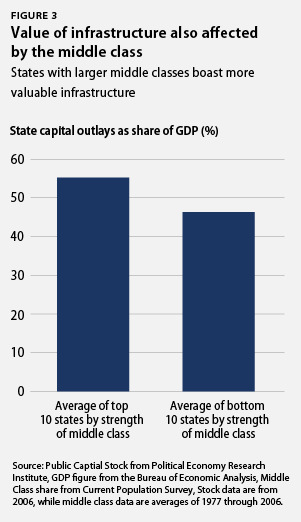 Rather than crowding out private investment, public investment “crowds in” private capital and thus spurs growth. Several academics have looked directly into the relationship between income inequality and public investments and found that societies with stronger middle classes are more willing to invest in growth-oriented public goods. In a 2001 paper New York University economist William Easterly argues that less income inequality, among other factors, creates a “middle class consensus” that promotes investment and growth. The paper finds a positive correlation between the share of income going to the middle fifth of the population and investment in infrastructure and human capital. Economists Alberto Alesina of Harvard University and Roberto Perotti of Bocconi University also find strong and positive correlations between the strength of the middle class and investments, both public and private, arguing that the middle class helps produce political stability, which is important for investment. As the authors write, “A ‘healthy’ middle class is conducive to capital accumulation,” and periods of high inequality are likely to reduce spending on public investment projects. Certainly, the relationship between the middle class and infrastructure does not only run one way; public investments also help build a strong middle class. Still, academics have attempted to tease out which way the correlation flows through such mechanisms as instrumental variables, and find that a strong middle class leads to greater public investments. While this academic research hasn’t directly examined the United States, there is good reason to believe their findings would hold here. But what is clear in our country is that the American public supports increased investments in infrastructure, yet the public’s desires aren’t being heeded. There are many explanations for why broad public support isn’t translating into political action, but at least part of the reason is the decline of the middle class. Because of rising economic inequality, our political system gives too much influence to the rich and far too little say to the broad majority of the population, as a host of academic studies have found, including those mentioned previously in this paper. Public investments are especially important to the middle class because they are depending upon good roads, transit, and public school, and their economic opportunities are closely tied to the fate of the country. In contrast, the wealthy have more options, so public infrastructure is less of a concern. They can opt out of public goods, such as schools, or carve out special provisions within services. According to academic studies, economic inequality can breed a selfish orientation toward public policy and reduce support for policies such as infrastructure spending that benefit many other people. Similarly, studies in experimental economics, a new field that explores the way people behave based on detailed analysis of behaviors in experimental settings, shows that inequality reduces the willingness of individuals to contribute to a public good and encourages people to behave selfishly. In contrast, people in strong middle-class societies feel they share a similar fate and thus are more willing to make investments in which they may not directly benefit. These investments include roads that they may not drive on, power lines they won’t use, and schools their children won’t attend. Skeptics might note that some wealthy Americans support increased infrastructure spending. They would be correct. Indeed, a large share of the very rich is composed of managers and executives of firms that may worry, for example, if the operations of their firm are affected by inefficient infrastructure and thus support certain types of infrastructure spending that they think would be beneficial. Other people who are wealthy may support infrastructure spending to help strengthen the country, or for any number of reasons. Evidence suggests that a majority of the wealthy probably do support increases in infrastructure spending—though it is hard to know with certainty because there is very limited polling on attitudes of the top 1 percent of income earners, or even the top 5 percent or 10 percent, about infrastructure spending. But the point is that while the wealthy may support some infrastructure investment, increased investment may conflict with more cherished priorities of the rich, namely low tax rates. Academic studies are very clear that the wealthy want lower taxes, far more so than the middle class. So when push comes to shove, infrastructure is likely to take a backseat to keeping taxes low. Take the current budget situation. The current level of federal spending was set by the Budget Control Act of 2011 after attempts to raise revenues were rejected. Now the current levels of infrastructure are constrained by the reluctance of the political system to increase taxes on the wealthy. The rich may say they support infrastructure investment but that support crumbles once it runs into higher priorities. In sum, academic research and our current political situation indicate there are a number of theoretical and empirical connections between the strength of the middle class and the level of infrastructure investment. The relationship between the middle class and the level of investment in infrastructure applies to U.S. states. Our analysis shows that states with a stronger middle class—as indicated by a larger share of income going to the middle 60 percent of income earners—invest more in infrastructure than states with a weaker middle class. Figure 2 compares the total annual infrastructure investments—in highways, schools, and utilities, for example—made by the 10 states with the strongest middle classes to the 10 states with the weakest middle classes. These annual state capital outlays, commonly known as infrastructure flows, are from the U.S. Census Bureau’s State Government Finances database and are the averages from 1999 to 2010, 12 years that cover 10 years of expansion and two years of recession. In combination with academic research, the chart about federal infrastructure at the beginning of this issue brief, and our previous research on education investment, this state-level analysis demonstrates there is a significant body of evidence that suggests a strong middle class is important for public investments. On average, the top 10 states by middle-class strength spent more than 50 percent more as a share of state domestic product than the bottom 10 states by middle-class strength. Altogether the top 10 states spent, on average, 0.48 percentage points more of state domestic product per year than the bottom 10 states. An increase of that size in the state with median state domestic product would have increased state infrastructure outlays by $7.6 million in 2010. 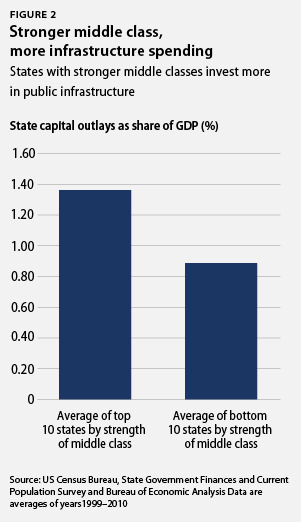 Some analysts prefer to evaluate infrastructure spending on a per capita, or per person, basis instead of as a share of state domestic product. A strong middle class remains highly correlated with infrastructure spending when measured in this manner, too. Over the years 1999 to 2010, the top 10 states by middle-class strength spent $607 per capita in state infrastructure spending outlays while the bottom 10 states averaged $354 in per-capita expenditures. Similarly, because the level of local government spending on infrastructure varies by state, it is worth noting that this relationship also holds when local infrastructure expenditures are included using the Census Bureau’s State and Local Government Finances dataset. Another way to think about infrastructure investment is the value of the stock: the present value of all investments in public infrastructure, summing together historical expenditures and accounting for the depreciation of those investments. 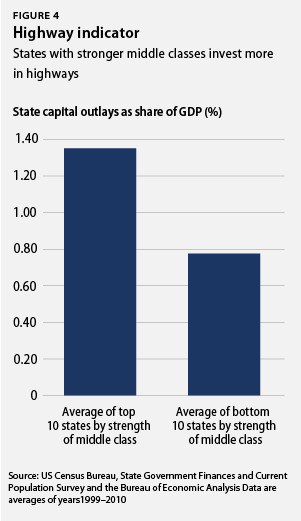 Figure 3 compares the stock of public capital investments in strong middle-class states with weak middle-class states. The stock data were provided by the Political Economy Research Institute, based on an analysis of Census Bureau data, and are from 2006. Because the capital stock is the result of years of investment decisions and is not solely determined in a few years, we compare the current level of a state’s capital stock (2006) with the strength of its middle class over a long time period (from 1977, the earliest year data are available, to 2006). As the graph shows, states with stronger middle classes boast significantly more valuable public infrastructure as a share of their economy. The states that ranked in the top 10 by strength of the middle class over the course of 1977 to 2006 had infrastructure worth an average of 54.21 percent of state domestic product in 2006 while the bottom 10 states averaged only 46.46 percent of state domestic product, a difference of 7.75 percentage points. An increase in the value of infrastructure by 7.75 percentage points as a share of state domestic product would equal an additional $10.6 billion in year 2000-constant dollars for the state with the median state domestic product in 2010. State spending on highway construction is another case in point. As Figure 4 demonstrates, highway spending is also related to the strength of the middle class. The top 10 states by middle-class strength spend about 70 percent more as a share of state domestic product on highways than weak middle-class states. America’s infrastructure is in dire need of renewal and improvement. Despite broad support for further investments, our federal and many state governments have not kept up with the demands of the economy and instead have let infrastructure crumble. Strengthening the middle class, while not the only solution, would help increase public investment in infrastructure. Lower levels of income inequality are associated with lower levels of political polarization and make government less susceptible to political capture by the wealthy. Academic studies find that countries with lower levels of inequality and stronger middle classes invest more in public goods. And as the charts in this issue brief demonstrate, American states with strong middle classes also invest more. For a variety of reasons, rebuilding the American middle class is an important step toward rebuilding America’s infrastructure. David Madland is Director of the American Worker Project at the Center for American Progress Action Fund. Nick Bunker is a Research Assistant with the project.